I have a small tank with a built in filter, I've never measured but I think it's probably a 30cm cube. I'm thinking of upgrading with ferts, a new light, and a small c02 system. What would you guys recommend? Or is that too small for ferts etc and I should just look at getting a bigger tank? Naa, do it , it will be fun. You have 10 x flow through the filter per hour, Just add CO2 with light. I don’t even light my 30 cube and I grow Algea quite well!!! Not too small for fertiliser but small tanks can have problems with CO2. If it doesn't work properly, you kill all the fish quicker due to the smaller volume of water. Perhaps just use a liquid plant fertiliser (I use sera florena but whatever you can get) and add a bit more light if necessary. There is plenty of CO2 in the tank from fish and filter bacteria, and also in the air, so you don't really need to add it. The glass tank itself could be the least expensive thing when it comes to upgrade. No the best reg and basically co2 is either off or very fast so its hard to dial you co2 bubble count in, but i got mine at about 1 bubble every 2 seconds. I run a tiny 0.5ltr ISTA co2 bottle, think it cost me about $30 bucks but cant find any online at the moment. Then just cheap ebay diffuser etc, all up would have been less than $100 for the co2 gear. Light is a 30cm up-aqua and I just use a all in one fert a few times a week, make sure you do your 50% water change weekly and you will be all good! Last edited by doylecolmdoyle; 18-05-18 at 05:14 PM. How long does the co2 last you if you run it 24/7? A month or 2 max? Depends how big the bottle is a guess also the rate of injection, this small 0.5ltr bottle lasts about 2 months. The bigger bottles (2.4kg I think) I use on my other tanks which run 24/7 have not been replaced for 6months. 24/7 co2 at a slow rate uses about the same as timed co2 trying to get 1ph drop before lights on. it's pointless running CO2 when the lights are off. Plants don't use it when it is dark. They use oxygen instead. Works well for me for the past two years, ill stick with it! Its more when the morning sun hits the tanks, my light cycle is from 5pm - 10pm... from sunrise they all get some sunlight, 3 of the tanks are kept outdoors, they can pearl just from the sunlight and I find running co2 24/7 keeps the algae away... not staying it isnt a waste of co2 but its a method that works for me and co2 is cheap. If you balance surface agitation there is no reason you cant have high o2 levels while still having co2 in the water. Last edited by doylecolmdoyle; 18-05-18 at 07:06 PM. For ferts, learn to mix your own! It'll cover all your tanks for a lifetime and you save heaps in the long run. It also gives you the choice to tailor your mixes to how heavily you want to dose. For example I created mixes for both my girlfriend's low tech tank (1 dose at waterchanges) and also my high tech EI daily dosed tank. You can get the dry ingredients cheap from dave @ aquagreen! rotalabutterfly.com helps with calculating the measurements. This was my 30cm cube. 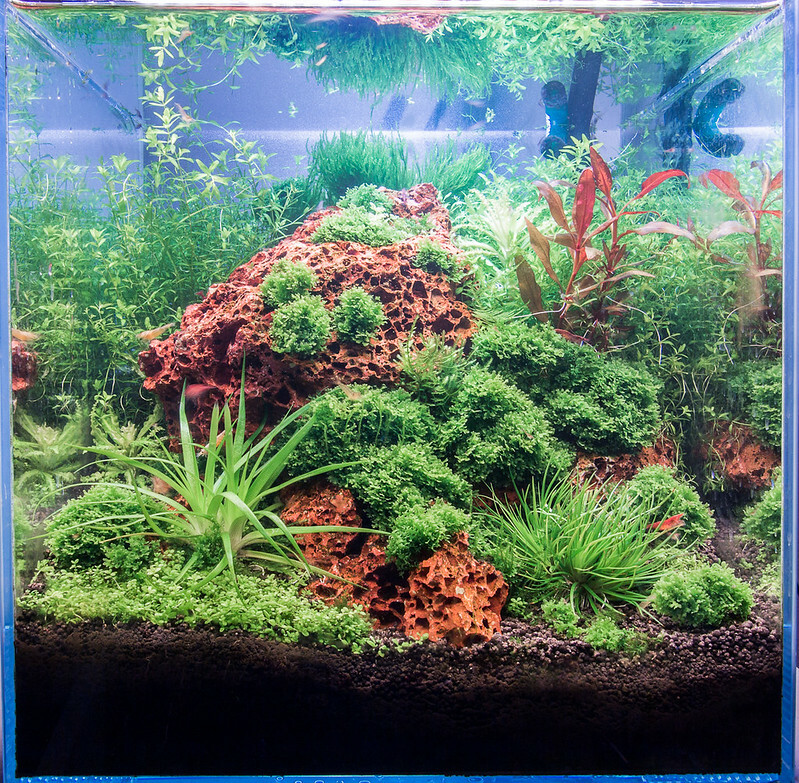 A small tank is very good for practice of various planted tank techniques. I highly recommend them for an enthusiast but not for beginners. This was my favourite picture of this tank. Last edited by Rebel; 19-05-18 at 04:39 PM. Thank you to everyone who responded - I am sorry for not being around to answer questions. My aunt died really unexpectedly and my life sort of exploded and my regular activities ground to a halt as a result. No hurry in this hobby. Take your time. Also, my condolences about your troubles! Last edited by odie_88; 13-06-18 at 07:47 AM. I used to run DIY c02 on my 3ft tank a decade ago. It was 2x 2L bottles with sugar, water and yeast, and sealing around a plastic tube that went up to Y connector thingie, and then into a diffuser in the tank. My issue was that I could never really get enough pressure in the bottle itself to put out a bubble more often than one every 20 seconds or so. If I re-created this on a smaller scale with a single 1.25L bottle, or even a 600ml, in theory I could have slow release C02 which might be a safer option so I don't kill my fish. I'm also considering setting a plant-only tank. Maybe I could experience with plants and ferts and lights and c02 while keeping current fishies safe from my meddling ways. The problem with this is the potential for MTS to take off!